Hip 21, a Street Boss filly who sold to Maui James for $150,000 to top the Texas 2-Year-Olds In Training Sale. 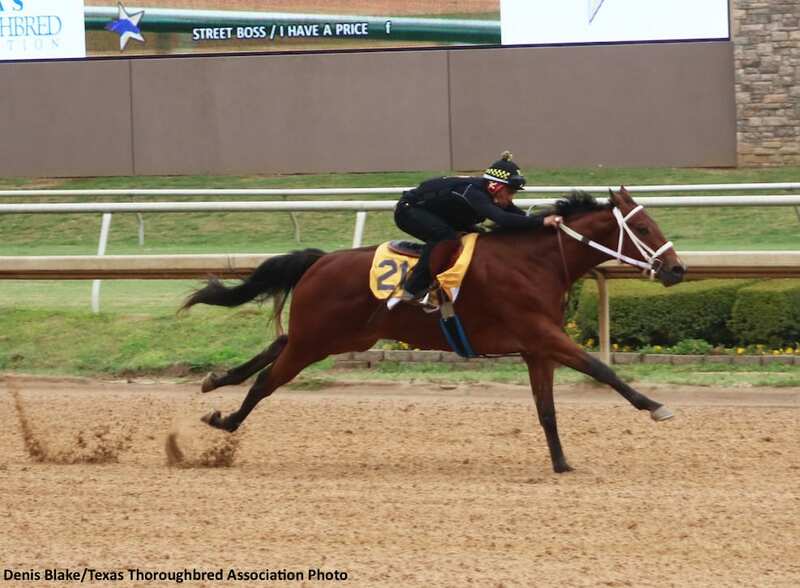 After four fillies tied for the fastest time during Sunday's under tack show at Lone Star Park, fillies again took center stage in Wednesday's Texas 2-Year-Olds in Training Sale with the five highest prices. The auction, sponsored by the Texas Thoroughbred Association and Lone Star Park, was held at the Dallas-area track. From 110 horses going through the ring, 75 head sold for a total of $1,751,400. The median was $14,500, up 10.69 percent from last year's $13,100, and the average dipped 9.27 percent from $25,737 to $23,352. Buybacks at this year's sale came in at 31.82 percent compared to 20.75 percent last year when 84 of 106 head sold for a total of $2,161,900. Hip 21, a daughter of Street Boss who worked an eighth-mile in :10 3/5 seconds in Sunday's under tack show, topped the sale with a $150,000 bid from Maui James. Consigned by Asmussen Horse Center, agent, the unnamed Kentucky-bred is the first foal out of the winning Successful Appeal mare I Have a Price. The highest-priced male, and sixth-highest overall, was Hip 129. The Oklahoma-bred colt, named Duffield and sired by Kennedy, sold for $62,000 from Bryan Ford, agent, to John James. This entry was posted in Bloodstock and tagged asmussen horse center, Bryan Ford, Carl R. Moor Mamagement, Clara Kelly, danny keene, Duffield, horse auctions, Horse Racing, I Have A Price, John James, Kennedy, lone star park, Maui James, street boss, Texas 2-Year-Olds in Training Sale, texas thoroughbred association, tim boyce, Twin Oaks Training Center, Twirling Around, Twirling Candy by Press Release. Bookmark the permalink.